Happy New Year to you all. I hope that this year brings you all good health and happiness. 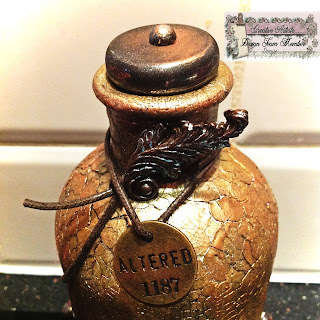 My first post for the New Year is for the Creative Artiste Mixed Media Challenge DT. As always the theme is Anything Goes, which is great as you get free range with your creativity! This month we are sponsored by the fabulous "Things to Alter", who provide all sorts of fabulous MDF goodies at exceptionally good prices! I began by giving it several coats of gesso until it was well and truly covered and looked more like a pottery bottle. I then painted the whole thing gold using DecoArt Elegant Finish Metallic Paint. It's the first time that I have used this and I have to say that I am very impressed with it. I then painted a layer of DecoArt crackle glaze all over and left it to dry. Once dry it was covered in DeoArt antiquing cream (black) and left to dry, then this was removed with a baby wipe. I repeated the last two steps three more times building up a patina of cracks and adding depth and texture with each coat. 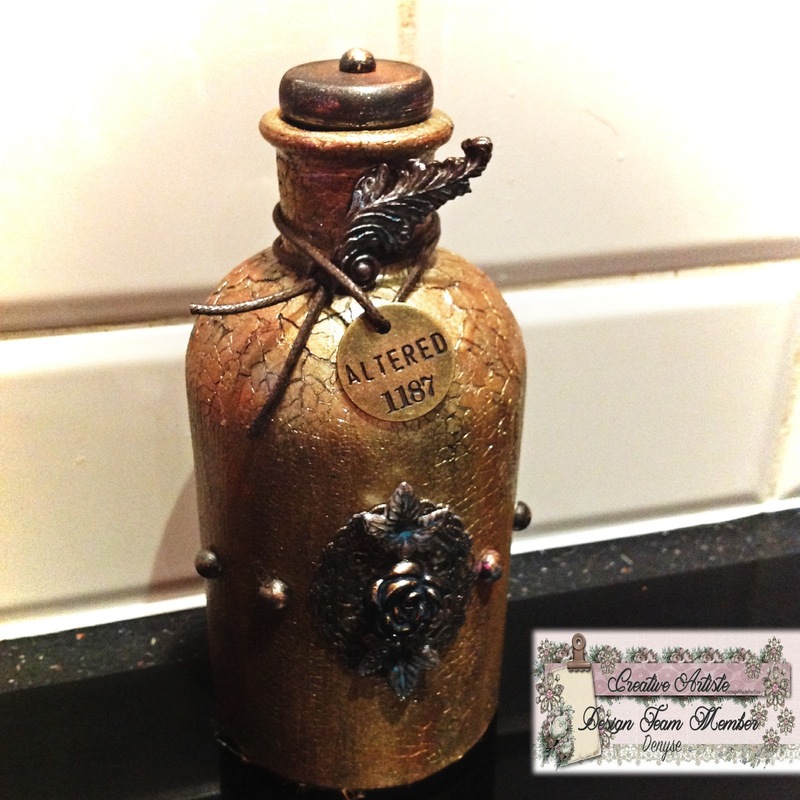 I then used DecoArt Metallic Lustre in Gold Rush to bring up the gold in some areas and dragged Treasure Gold White Fire down the bottle to add coppery glints as well. To decorate I used a silicon mould of a swirl and also one of a rose.I poured Powertex into the moulds and left them to dry. I also found two white pearl leaf embellishments. All of these were buffed with Decoart Antiquing Cream in Patina Green and I deliberately left traces of it on to give an aged affect, they were also given a good amount of Antiquing Cream in black and a small amount of the Treasure Gold wax . The swirl was glued on to the neck of the bottle. I did the same with some bright pink flat back pearls which I have never found a use for! I also took a lovely metal embellishment and buffed it with the antiquing creams in Green and Black and the Treasure Gold. 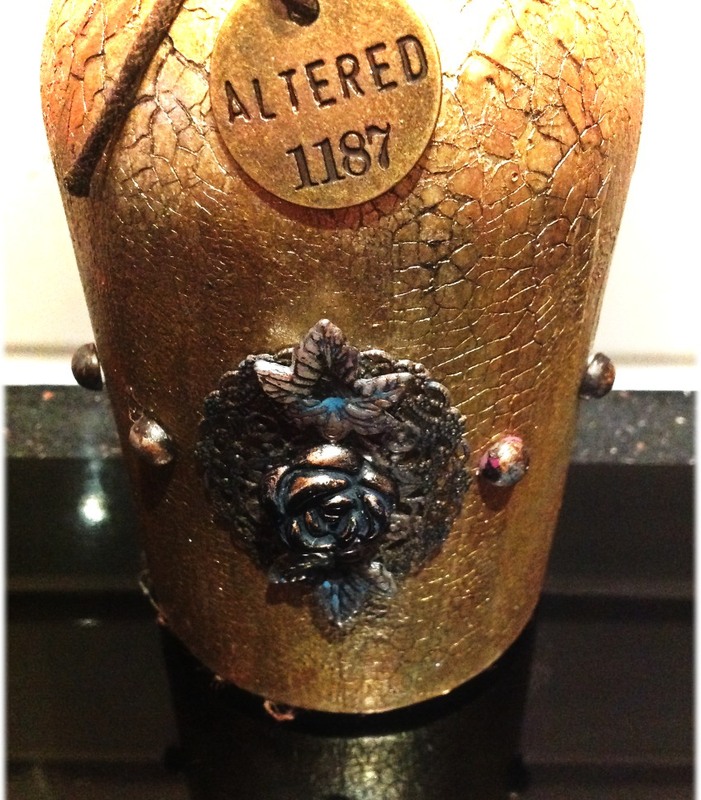 The powertex rose was glued on to the centre of metal embellishment and the leaves to the top and bottom of it. The pearls were added as studs around the bottle. I used a bright silver aftershave bottle lid to finish off. This was sponged in DecoArt Black Fluid Media paint and also the gold. it was also daubed with the Treasure gold once dried and a flat back pearl was added to the centre to finish it off. Finally I took a length of cord and a Tim Holtz Brass tag which says (appropriately enough!) "Altered", and hung it around the neck of the bottle. I must admit I am really pleased with how it turned out. I meant to take more photos at different stages but it got difficult as I got messier and in the end I was too engrossed to remember!! will try harder next time!